Red Headed Femme: "Life is a sum of all your choices"
"Life is a sum of all your choices"
It's rather interesting how several swing-state newspapers have endorsed President Obama for re-election. The latest, the Cleveland Plain Dealer, does so here. It's a tepid endorsement in a couple of places, but it's still an endorsement. Consider a defining moment early in Obama's first term -- one with special resonance in Ohio: The outgoing Bush administration had used TARP funds to throw a lifeline to General Motors and Chrysler, but the two automakers were still at death's door. They wanted more cash and offered vague promises to change their ways. Public opinion opposed another bailout. Romney urged the companies to file for traditional bankruptcy -- at a time when private-sector credit was frozen even for healthy firms. Obama told the companies to restructure using the Bankruptcy Court and set conditions for government financing: GM's chairman had to go. Excess plants and dealerships had to close. Chrysler had to be bought out by Fiat. Contracts had to be renegotiated. It was unpopular but gutsy. And it worked. Ohioans today are making cars in Lordstown and Toledo. They're making parts and steel for Ford, Honda and other automakers. They're back on the job. That's leadership that deserves a chance to finish the job. Re-elect President Obama. The Denver Post weighs in here, pointing out that Mitt Romney's numbers and policies simply don't add up. 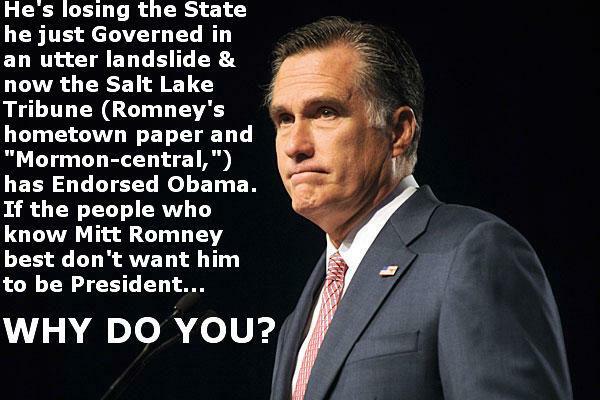 We know that many have a different view, and point to Romney's record in Massachusetts as ample reason for his election. Unfortunately, he never seriously campaigned as a centrist alternative to Obama. From running to the far right on immigration and women's health in the primary and then saddling his campaign with Rep. Paul Ryan's extreme and unrealistic budget, the Romney of this election cycle is not the man elected in Massachusetts. Instead, we must judge him on the menu of options he has repeatedly put forward during this campaign. On policies ranging from tax reform to immigration, from health care to higher education, none of Romney's numbers add up. Moreover, he has been unwilling or unable to outline for voters specifics that demonstrate his math works — probably because it doesn't. Romney has said he will repeal Obamacare, yet insists he can keep its most popular provisions without fully explaining how he would pay for it. He's calling for 20 percent tax rate cuts across the board. Independent analysts say the government can't come close to making up for that lost revenue without closing popular deductions like those for home-mortgage interest and charitable contributions. Romney's explanations for how he would do that don't wash.
And his pledge to create 12 million jobs in four years sounds good, but Moody's Analytics has predicted that type of job growth regardless of who is elected. The Tampa Bay Times chimes in with its endorsement--rather ironic, considering this was where the Republican National Convention was held. Considering Florida's senior population, hopefully this will carry some weight. 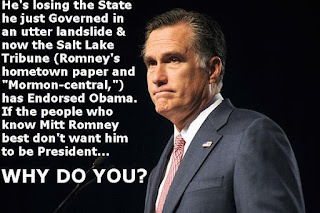 Finally, the Salt Lake Tribune, in Mitt Romney's home state, endorses the President--and absolutely mangles Mitt Romney. This prompted a .png that I posted to my Pinterest board. There's your choice, America. Choose wisely.